My question relates to the generally cited rule of thumb that unglazed areas of Ming period pieces should appear "burnt orange or reddish". Are there general exceptions to this standard? 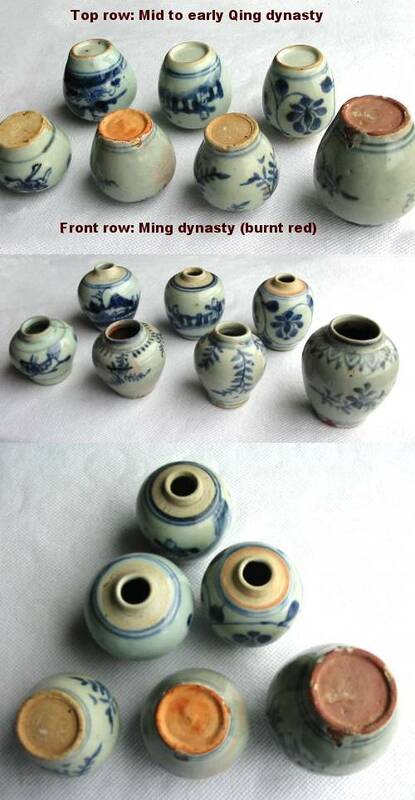 Does it apply to all types of glazes or are areas of origin or specific periods of Ming associated with exceptions--is this general standard appicable to blue and white/celadons/ other monochromes, etc.? Also is the burnt orange appearance throughout the clay or just on the surface--that is if there is a chip would the chipped area be a different color? I assume this appearance is also applied to copies and fakes--what are clues that this appearance has been simulated (assuming that it is a "good" fake job)? Sorry for all of the questions, but any guidance that you have is appreciated. These pictures are thanks to Simon Ng, Hong Kong. The front row is Ming, the top/back row is Qing. Clearer then this I don't think it is possibly to demonstrate what the old scholars meant by coming up with this rule of thumb. This does not mean that there are no exceptions, but it is a good thing to remember when you start out as a collector.